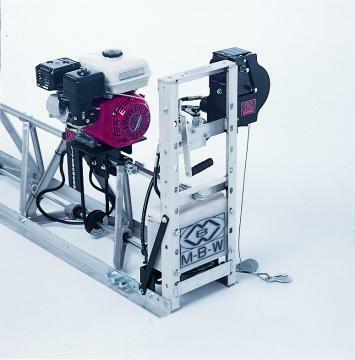 MBW's Blitzscreed® is the state-of-the art in vibratory truss screeds. The Blitzscreed is set-up and cleaned in roughly half the time of other screeds. Mechanical problems common to other designs are eliminated. All bolted construction eliminates weldment failure. MBW's patented offset eccentric shaft/bearing design results in far more uniform vibration across the screed and greatly extends bearing life. The patented quick coupling method of joining section shafts is fast and eliminates failure of mechanical connectors.